STOUGHTON, Mass. – Sometimes things don’t always go according to plan. Yet, sometimes things work out just fine anyways. Stoughton loaded the bases in the bottom of the ninth inning in a tied game and looked to squeeze the winning run across. Junior Pat Hagerty laid down a near perfect bunt down the first base line but the ball just trickled foul. At the next at bat, Hagerty didn’t get a second chance at the bunt, instead getting drilled in the leg with a fastball. 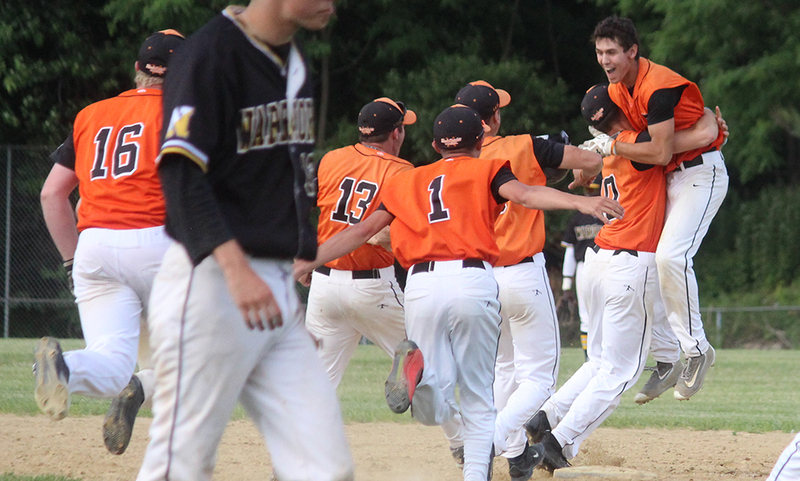 But that was just fine for the Black Knights, as Hagerty took first and forced junior Luke Johnson in from home for the winning run, giving Stoughton a 3-2 win over Nauset and a spot in the D2 South Semifinal. 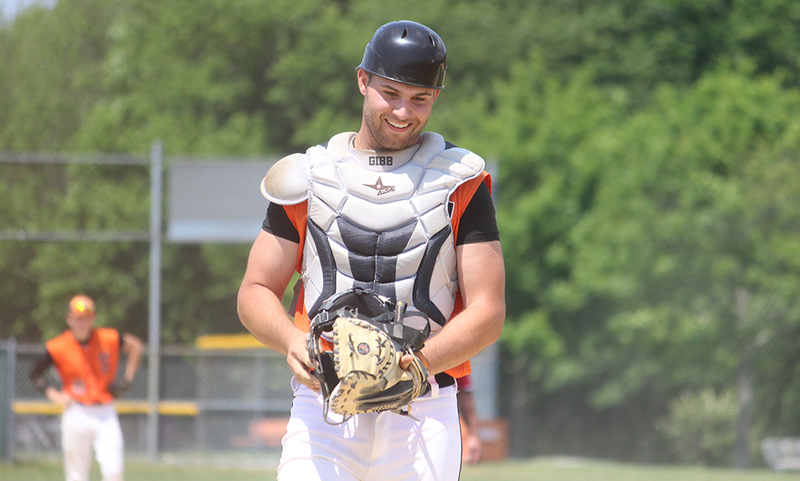 Stoughton trailed twice in the game, a 1-0 run after just a half inning and a 2-1 deficit just a half inning after the Black Knights had tied it. Stoughton tied the game in the bottom of the sixth, eventually sending the game to extra innings. Johnson got things started in the bottom of the ninth, roping a lead off double down the left field line. Nick Hardy attempted a sacrifice bunt and Nauset pitcher Paul Prue charged in and tried to look Hagerty back at second. Instead, he was unable to field the ball cleanly and Hardy reached safely. Prue induced a fly out to second but junior Justin Hutchinson worked himself to a walk with a full count, loading the bases. That’s when Hagerty was hit on the leg on the second pitch to send the Black Knights into the semifinal round. Nauset took the lead in the first inning when Prue led off the game with a double and moved to third on a ground out to second. Nauset’s Mac Labarge hit a dribbler back up the middle and Stoughton pitcher Ryan Sullivan charged and flipped to catcher Jake Gibb. Gibb appeared to make the tag in time, with the home plate ump calling Prue out. However, an appeal from Nauset and a discussion between the umps resulted in a reverse decision and a 1-0 lead. It looked like Stoughton would not only tie the game but possibly take the lead in the third inning when Ruben Gonzalez (single), Hutchinson (error) and Hagerty (walk) all reached consecutively to load the bases with no outs. Nauset starting pitcher Mike Doherty induced a shallow pop up to right to get the first out but Gibb skied one to left field, deep enough for a sacrifice fly to tie the game. Doherty got the third out via a grounder to get out of the inning with just one run allowed. The Warriors responded immediately with Doherty launching a two-out double and Kino Gray following it up with an RBI triple into right center field. Sullivan got out of the inning with a ground ball to first. Gibb got Stoughton’s tying run rally in the sixth started with a one-out single through the left field of the infield. Nauset decided to bring Prue in to replace Doherty. Prue pitched a complete game two-hit shutout this past Thursday against Oliver Ames. That didn’t bother the Black Knights though. “We were aware of who he was and at that point in the game, it was just bring it on,” Armour said. Jack Connelly grounded into a fielder’s choice to move pinch runner Matt Gallagher to second. Ryan Sullivan then reached on a grounder to third as Gallagher was able to elude the tag in the base path and Sullivan was ahead of the throw. Johnson then muscled a hit over the head of the third baseman to bring in the tying run. The tying run seemed to inspire Sullivan on the mound. He came back out in the top of the seventh inning and struck out the side, needing just 13 pitches. Sullivan came back out in the top of the eighth, getting the Warriors in order, punctuating his performance with his seventh strikeout. In the top of the ninth, Nauset attempted to regain the lead against Stoughton reliever Nico Parmegianni. Doherty led off with a single but Parmegianni induced a pop up for the first out. Parmegianni got another fly ball, this one to right field, where Sullivan relocated after coming off the mound. Sullivan charged in, catching the ball and firing a rocket — after throwing eight innings — right on the mark at first for the double play. Stoughton baseball advances to the D2 South Semifinal for the first time since 2013. The Black Knights will take on top seeded Dighton-Rehoboth on Wednesday at Rockland High School. First pitch is set for 4:00. STOUGHTON, Mass. – They did it all regular season, and on Saturday afternoon, they did it again, this time in the postseason. 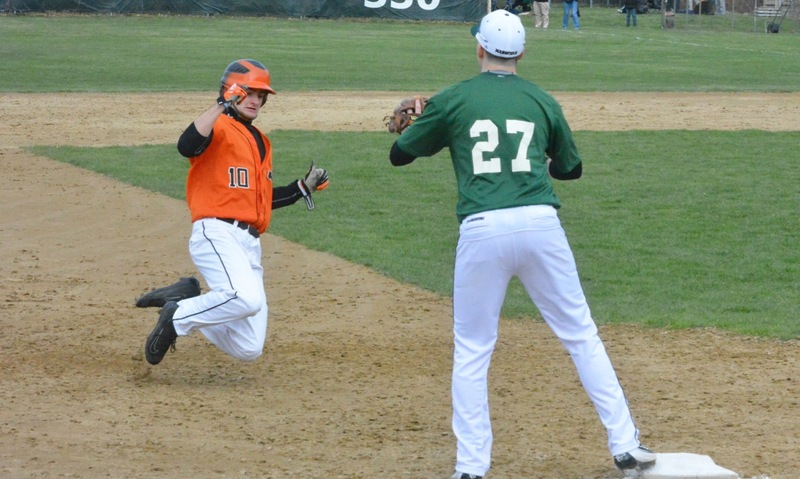 Justin Hutchinson orchestrated a masterpiece on the mound while Jack Connelly backed his pitcher up with the biggest hit of the season to guide Stoughton past Hopkinton with a 2-1 victory. Hutchinson delivered a complete game performance striking out 11 while allowing just six hits and three walks. The right-hander recorded at least two strike outs in the second, fourth, fifth, and sixth innings with only three Hiller baserunners reaching third. The Black Knights saw themselves down one entering the bottom of the sixth, but they were determined to get the run support that Hutchinson had so rightfully earned. After Hopkinton retired the leadoff hitter, shortstop Doug Seamen started things with an infield single to the shortstop hole. The Hillers looked like they were on the way to picking up the second out on a Jake Gibb grounder that got under a diving Chris Burdick at third and into the glove of shortstop Jack Vaccari. However, Hopkinton’s first baseman couldn’t secure the throw allowing Gibb to reach and Seamen to land at third with one out. Matt Gallagher came in as a pinch runner for Gibb before Connelly stepped up to the plate. Like the junior first baseman has done all season, Connelly belted the most important hit of the contest to ultimately decide the Black Knights’ fate. On the first pitch of the at-bat, Connelly ripped a shot into deep center driving in Seamen and Gallagher for the game-winning two runs. With Stoughton ahead 2-1 and the top of Hopkinton’s lineup due up, Armour elected to stick with Hutchinson for the seventh. The gamble was well-worth it as the starter induced two grounders and struck out his eleventh batter for the last out in the opening round of the tourney. After placing runners on base in each of the first five innings without producing a run, the Hillers knocked in the game’s opening run in the sixth. Burdick reached base on a walk, got to second on a sacrifice bunt, and came across the plate as Tom Onsi helped his own cause with a single to center. Besides that blemish, Hutchinson continued his season-long success on the mound. Opposing Hutchinson, Onsi was equally as dominant. The Hiller starter was unhittable in the first three innings besides mistakes coming on an issued hit batter and base on balls. Connelly spoiled his no-hit effort in the bottom of the fourth with a single to right. “He pitched a great game. He had us off balance and kept us in check,” Armour said of facing Onsi. Failing to reach the tournament in 2015, fourth-seeded Stoughton (16-6) is not thinking of the past and has its eyes on the future. The next step in the future comes on Tuesday when the Black Knights host fifth-seeded Nauset in a quarterfinal matchup. Because of how the schedules are set, cross-division games aren’t typically at the end of the season and therefore division champs rarely get the chance to face off bragging rights. But due to some postponements, Stoughton and King Philip’s game was pushed to the last weekend of the season, pitting the Davenport division champ against the Kelley-Rex division champ. With that, there was plenty of bragging rights on the line as the Black Knights hosted the Warriors in a Saturday matinee. And on top of that, Stoughton was looking to snap a two game skid before entering the tournament. But even with all of that to play for, Stoughton was simply playing for one another, for the team. “It’s been an emotional day,” Stoughton head coach Mike Armour said. “We actually went to a wake this morning, as a team, for one of our guys who lost his dad. It’s been a long day but this is a tight knit group, this is a family really. In the end, the Black Knights walked away with smiles on their faces and the bragging rights with a 8-3 win over KP. It didn’t take long for the fun to start for Stoughton. Senior Chris McNulty led off the bottom of the second inning with a single and moved to second on an errant pick off attempt. KP starter Jack DiCenso got back to back strikeouts but Stoughton junior Pat Hagerty connected for an RBI double off a 1-1 count to give the Black Knights a 1-0 lead. The Black Knights continue to roll into the third inning with starter Barry Cooke needing just six pitches to get through four batters in the top of the third and the Black Knights’ offense added two more runs in the bottom half. Doug Seaman drew a one-out walk and stole second base. Senior Jake Gibb drilled a single into left center and a bobble in the outfield allowed Seaman to round third and come in safely and Gibb to reach second. Jack Connelly followed with a double to bring Gibb home to make it 3-0. After Cooke got through a two-out single from Ryan Coulter, his second of the day, in the top of the fourth, Stoughton’s offense was back at it in the bottom half. A lead off single from Hagerty caused a pitching change as KP head coach brought in Jake Cavanagh to replace DiCenso. Nick Quattrucci’s sacrifice bunt moved Hagerty up and a bloop single from Ruben Gonzalez put runners on the corners. A wild pitch brought Hagerty in from third and Gonzalez, who stole second, moved to third. Gibb walked and then the Black Knights executed a double steal with Gibb sprinting to second, drawing a throw, allowing Gonzalez to race home to make it 5-0. King Philip was able to breakthrough against Cooke in the top of the fifth but only pulled one run back. Sophomore Patrick Limerick drew a one-out walk, stole second and then came around to score after a pair of walks. Cooke was able to get the third out with a runner on third to limit the damage. Justin Hutchinson retired KP in order in the top of the six and the Black Knights added key insurance runs in the bottom half. A leadoff triple by Ryan Sullivan turned into a run when Gonzalez reached on an infield error. Seaman singled through the left side and the ball eluded KP’s left fielder, allowing Gonzalez to scamper home from second and Seaman to race to third. He scored Stoughton’s third run of the inning on a passed ball to make it 8-1. King Philip rallied as Will Weir and DiCenso each had a two-out RBI in the top of the seventh with Ryan Guenette and Jon Rolfe, who both walked, scoring runs. But Hutchinson was able to close the door, ending the Warriors’ rally. Cooke got the win, allowing one run in five innings of work. The win gives Stoughton the bragging rights with a head to head victory over KP. Stoughton baseball finishes the season with a 14-6 overall record and 13-3 in league play. King Philip finishes 15-5 overall and 11-5 in the league, finishing in a tie with Taunton for the Kelley-Rex crown. Seeds for the MIAA tournament will be released on Tuesday. STOUGHTON, Mass. – The Black Knights’ baseball team hasn’t faced a deficit very often this season, nor have they played in many close games. They had to deal with both on Friday afternoon, but that wasn’t necessarily such a bad thing for head coach Mike Armour. Stoughton rallied from a 3-1 deficit, scoring a run in each the fifth, sixth and seventh innings, the last being a walk-off hit by junior Jack Connelly to hand the Black Knights their sixth win of the season. Senior Jake Gibb was the catalyst of the comeback, starting with a big defensive play. He threw out a Milford base runner trying to steal second to give Stoughton some momentum heading to the bottom of the fifth. Stoughton capitalized with leadoff man Pat Hagerty drawing a walk on a full count and advancing to second on an infield hit from Doug Seaman. Gibb followed up with an RBI single through the left side, playing Hagerty to make it 3-2. Seaman made a nice play at shortstop to end the top of the sixth and Stoughton used that momentum to tie the game in the bottom half. Luke Johnson reached on a hard hit ball that got through at second base and Justin Hutchinson’s hit was bobbled at shortstop to put two on with no outs. After a sac bunt from Nick Quattrucci advanced the runners, Hagerty plated Johnson with a sacrifice fly to make it 3-3. Hutchinson shined on the mound in his seventh inning of work in the top of the final inning. He needed just 11 pitches to notch his ninth, 10th and 11th strikeouts of the game to give the Black Knights a wave of momentum entering the bottom of the seventh. Gibb helped finish the rally he started two innings earlier, leading the bottom half with a double. 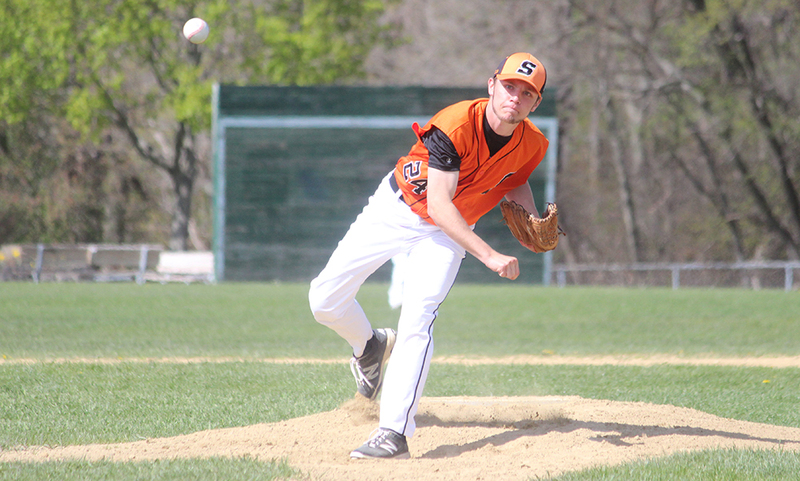 Senior Kyle Romaine came in as a pitch runner for Stoughton and Connelly connected on a 2-2 pitch, driving the ball into left field, right out of the reach of a diving Alex Coady for the winning run. Both teams scored in the first inning before the Scarlet Hawks pulled away through the middle innings. In the top of the first, Chris Speroni led off with a single, moved to second when Coady reached on an error and then scored on a two-out RBI single from Anthony Arcudi to make it 1-0. Gibb drew a two out walk in the bottom of the first, moved to second on a wild pitch and then to third when the throw to second sailed into the outfield. A single from Connelly plated Gibb to tie the game 1-1 after an inning. The Scarlet Hawks tacked on a run in both the third and fourth innings. Coady walked and moved to second after an errant pickoff throw. Blake Hill reached on a fielder’s choice and then a throwing error allowed Coady to scamper home from third. Milford’s third run came in the fifth after a leadoff single from Nick Johnson. A sac bunt from Brian Ireland pushed Johnson to second and he came in to score on a triple from Alex Macek. Both starters pitched well, with Hutchinson earning the win in a complete game effort. Hutchinson struck out a career-high 11 batters, scattering six hits and issuing just two walks. Macek was strong in his season debut on the mound for the Scarlet Hawks, allowing just one run in five innings of work while striking out six. “Stoughton did a good job, they capitalized on our inability to finish seven innings, that’s been our problem all year,” Milford coach Paul Pellegrini said. “We haven’t played great defense and it shows sometimes. We had a couple mistakes there in the sixth. Whether they were errors or not, the ball was in front of us so we have to make those plays. We just haven’t completed a game yet. We had a lead on OA late the other day and the same thing, we made errors. You can’t do that against teams that can play. Stoughton baseball improves to 6-2 overall, 6-1 in league play and will be back in action on Monday when they host King Philip in a battle of division leaders. Milford (2-6, 2-7) will look to bounce back the same day when they play host to Franklin.